It’s th e most wonderful time of the year…LITERALLY! CHRISTMAS, I WELCOME YOU WITH OPEN ARMS. So, last year Mason was four months and, I mean, his eyes weren’t even fully developed to see all the things properly and I was convinced his gas facial expressions was him smiling at Will Ferrell in ELF. Next year my new little one will be 10/11 months and, honestly, I am so excited because he will be able to notice all these things. The tree is up and decorated in a new theme and YES, Mason has thrown himself into the tree when he is mad, and yes, he has learned his lesson, but now results to walking by the tree and ripping off an ornament when he thinks you aren’t looking. Will Mason remember this years Christmas on steroids? I don’t think so, but I will. There are so many things I just love doing this time of year, even before we had Mason. Following are some of the things I have gotten for Mason to make this year’s and all the other years a little more fun. First off, Mason’s Elf on the Shelf, Bernard, has arrived and this kid is loving him, NOT A LIE GUYS. BIG HIT! We are going on day seven, so reach to me on day 15 and see how it’s going. So, when I was on Etsy and ran into Jennifer’s ROCKPAPERPRINTZ shop, I LOVED THE IDEA! I knew I had to have one for Mason and plan to get one ordered for the nameless one by the end of the month. 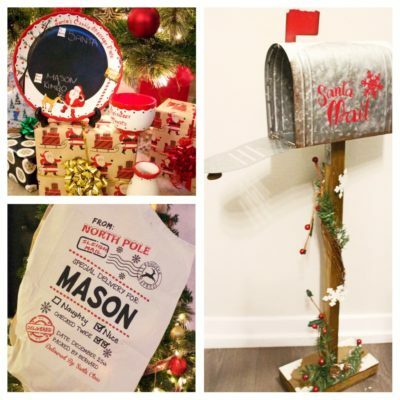 I messaged her about her Santa sacks and not only loved her product, but she is genuinely an amazing woman working on her business along with her husband. The design we chose for Mason is the one she started out with and is her best seller! 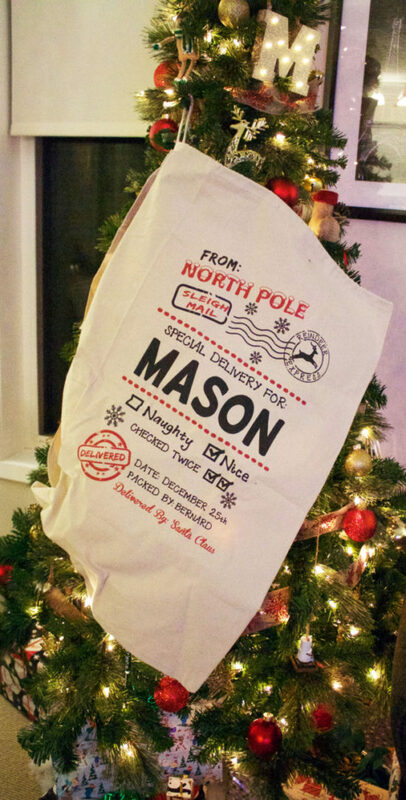 The quality is amazing and honestly how much fun is it going to be when your little ones come downstairs with a personalized sack that Santa delivers their presents in? Jennifer is so talented, if anyone is interested here is the link to her shop. She is giving my readers and friends 15% off until December 25th just put in the code EXTRASPARKLES. If you want this by Christmas make sure you order by the 18th (you will have to upgrade your shipping on that date though). – Click HERE for the link to Jennifer’s Store and to get your Santa Sack today…and again don’t forget that discount code! Another tradition is the Jolly Santa Plate from Indigo. 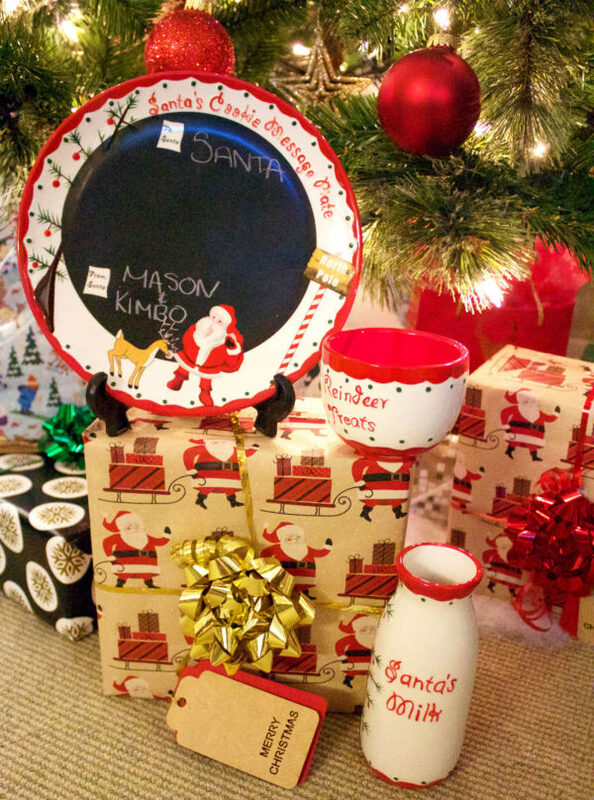 This keepsake plate set – The perfect place for Mason to leave cookies and milk out for Santa along with a little bowl for the reindeer to get some treats too DUHHHH! The plate has a chalkboard surface to leave Santa a note and can be kept for years while being passed down for generations or until someone breaks it. You can get yours HERE or at Indigo!! Regular: $39. 95 and on sale now for $29.00! Lastly, is my Santa mailbox from Michael’s. YUP, This was my must have Christmas decoration this year. 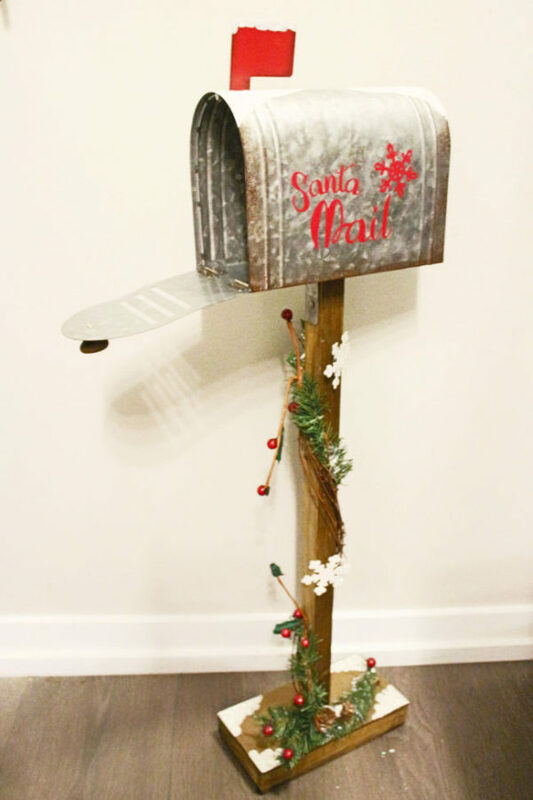 For those of you who mail letters to St. Nick, this is the perfect little out for mail spot to put their letter until you finally remember to take it to the mailbox. For others with children Mason’s age… it’s the perfect spot for your human to steal your cellphone, run, put it in there, close it and watch you look everywhere for it. Then have to wait until someone texts you to realize where its location is. Thank you child, that just got a gift put into the return pile (LOL )and yes that happened. Get yours today at Michael’s. They have so many different designs too! Its priced at $69.99 and that was a big nope for me, so go on their website and grab the 40% or 50% off coupons and get it for $35.00 like I did! So these are a few of my favourite Christmas touches for 2016 <3 and there are so many other amazing this out there! Let me know some of your favs! Cheeky ways to help with teething! Always a great read Georgia! I hope your are making your famous cupcakes this year!